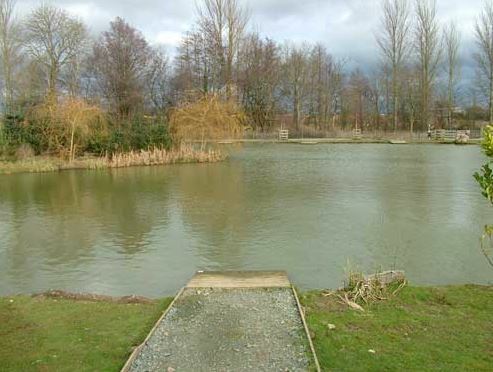 This privately owned fishery has a top class tackle shop,caravan touring site plus log cabin accommodation. 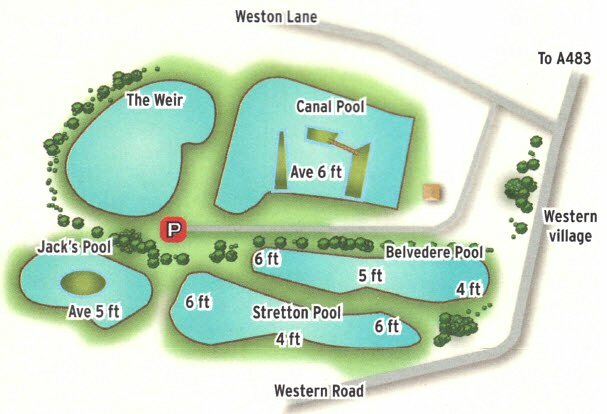 There are also five fish packed pools plus a sixth, the Claypit, a mile away on the Sweeney Estate but under the same management Canal has carp to 10lb, F1s and barbel to 5lb, tench to 3lb plus crucians, roach and other silvers to 1lb. Belvedere is home to barbel over 12 lb, carp to 10 lb, F1's to 5lb, tench to 4lb plus crucians. Stretton has carp to 10 lb, barbel to 5lb, F1's to 3lb, tench to 2lb and ide to 1lb. Jack's for carp to 15 lb, bream to 7lb, F1s to 6 lb, barbel, tench and ide to 5lb, roach to 2lb and crucians to 1lb. Weir houses carp to 8lb,barbel and F1's to 5lb, tench and ide to 3lb plus bream. Claypit has carp to 18 lb, bream to 8lb, F1's to 5lb, tench to 2lb plus perch, ide and roach. All the usual 'commercial' tactics will work at this prolific fishery. Float fishing scores well, especially down the margins but on Jack's Pool a small feeder to the island does pick up a lot of fish. The best baits are pellet and corn, although caster and maggot account for prolific hauls of silver fish. Other baits well worth a try include chopped worm and bread. The feature swims and there are plenty. Adults £8.00 - Under-14s, OAPs and registered disabled £6.00 for one rod. Tickets to be bought from the on-site shop before fishing. Fishing times are: 7am to 9pm in summer or 8am to 4pm in winter. Season permits are also available for Claypit. Disabled access. Barbless hooks only. No keepnets. No night fishing. Industrial Estate. Take first left and go over rail bridge then turn right into Weston Lane and follow this down to the fishery and car park on your left.